Most of our tubulars are sold during cross season where the vast majority of cross racers use them. Now that more and more bikes are coming with disc brakes these are a great upgrade. They have the wider rims so will hold more glue - critical for Cross use. The rear wheel OLD is 135 mm - standard for most Cross bikes. 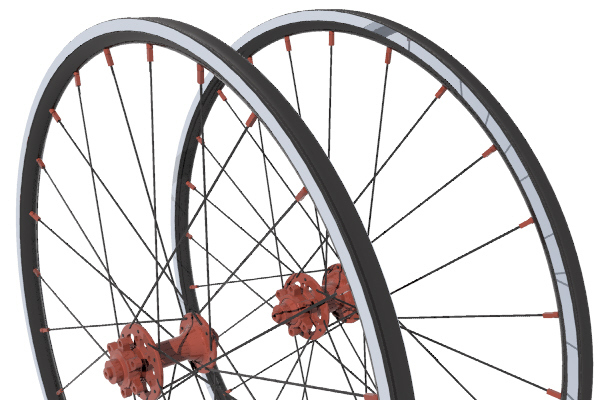 For extra durability, we use internal on the drive side rear spokes - for more info on this great feature please check out the Rim Page on the column at left. They are also seriously light at 1320 grams for the set. I often ride tubulars and put tire sealant in them. I find that the sealant will take care of almost all flats and that the only time I need to take a tire off is when it's worn out. Another great alternative is to carry the sealant with you and if you get a flat instead of changing the tire you add sealant an pump it up. Weight 1420 grams (without skewers or rim strips) weights can vary by about 50 grams a set due to rim, spoke, and hub weight tollerances.